Robbie and I had a rough day today!! Robbie was in extreme pain in his foot. We had to be at Anderson all day for appointments and there wasn’t anything I could do to help him. Dr Lin said that Robbie has low calcium in the bones in his foot called osteopenia. This is causing pain and brittle bones. No weight baring for a month. Will check his foot in two weeks. He also has to wear shoes all the time to protect his foot. The Dr told him astronauts get this too. It is caused by having little use the last few months. His stitches came out today and Dr Lin is pleased with all the work Robbie and his therapists have been doing with his leg. 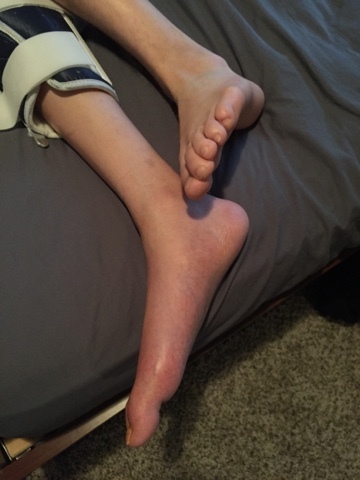 Robbie has to continue to work with his leg everyday.